The work was one of several non-signed pieces - thought to be by the anonymous graffiti star - that appeared across the capital in June 2018. 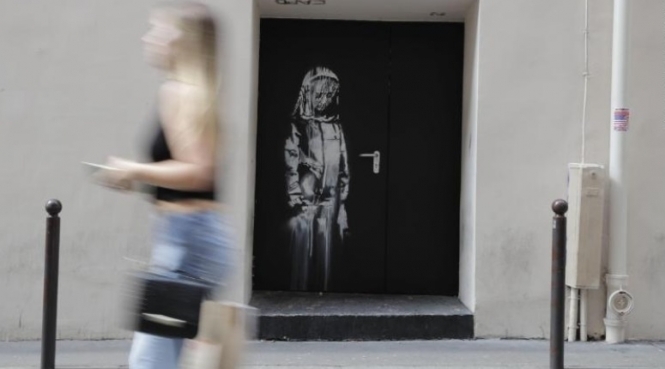 One artwork in particular was painted on to a door of the Bataclan, a music venue that was the site of one of the worst atrocities of the terrorist attacks. Ninety people died after attackers opened fire during a show by the band Eagles of Death Metal on November 13, 2015. On social media, the Bataclan team itself has condemned the theft of the artwork, in “deep indignation”. It said: “This work by Banksy - a symbol of remembrance that belongs to all of us: residents, Parisians, citizens of the world - has been taken. According to reports from the Agence France-Presse, the artwork was stolen overnight from Friday January 25 to Saturday January 26, by individuals wearing cagoules. They used an electric angle-grinder to take the piece, before loading it into the back of a van and driving away. Artwork by Banksy can command prices into the millions when sold. In October 2018, a New York auction made headlines after the famous “Girl With Balloon” work was shredded immediately after being sold for more than £1 million (€1,156,250). Banksy later revealed that the damage had been intentional, with the painting initially created with a shredder built in to its frame. The “new painting” has since been renamed “Love In The Bin”.